If you’re total novice on the banjo, but want to learn to play, you’ve come to the right place. I’m going to show you how to be up and playing the banjo in no time flat. Now, set your banjo on your lap in playing position. The short string is the 5th string. The string closest to your feet is the 1st string. Pluck the 1st and 5th strings together at the same time using your thumb and middle finger. That is called “The Pinch.” Now you’re going to do what’s called the “Thumb-Pinch.” Play the 2nd string followed by a pinch. They try the 3rd string followed by a pinch. Finally, play the 4th string followed by a pinch. The rhythm of the Thumb-Pinch should sound like “Tick Tock.” Keep a steady Tick Tock while your thumb randomly moves from playing the 2nd string, the 3rd string and the 4th string. Now you’re ready to start playing songs. The following list of almost one hundred songs have only two chord changes, G and D. What is a chord? It’s a group of notes that sound good together. If you are tuned in G tuning (gDGBD), all the “open” or unfretted strings are part of a G chord. Each verse of a song nearly always starts and ends on a G chord. Somewhere in the middle or end of each verse, the song will change to a D chord. For simplicity’s sake, you don’t even need to bother to play a D chord. When you think the song changes to a D chord, merely play the 4th string followed by a pinch. (The 4th string is tuned to a D note, so playing that string will suffice for a D chord). How do you know when to change chords? The melody of any song can be accompanied by chords that harmonize, or sound good, with the melody. If the melody clashes or sounds bad with the chord, then change to the other chord. To play your banjo with any of the following songs, you’ll need to sing, hum or whistle the melody. First, strum all your strings once or twice to get your voice in the same range as your banjo. The first note of the song you’ll be singing is nearly always either the 1st, 2nd, or 3rd string on the banjo. Not familiar with these songs? In that case, you can certainly find film clips of most of them on YouTube. 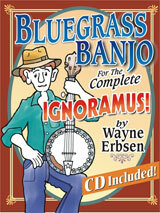 For more help with learning to play the bluegrass or clawhammer banjo, check out my best-selling banjo books (w/audio tracks): Bluegrass Banjo for the Complete Ignoramus!, Clawhammer Banjo for the Complete Ignoramus! , and Bluegrass Jamming on Banjo. They are available as spiral bound paperbacks or eBooks here at nativeground.com. Don’t know the difference between clawhammer and bluegrass banjo? 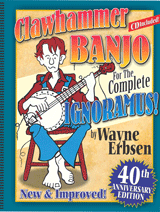 Then read my article on “What is Clawhammer Banjo?” My banjo books are written in a friendly and easy style expressly for total beginners.